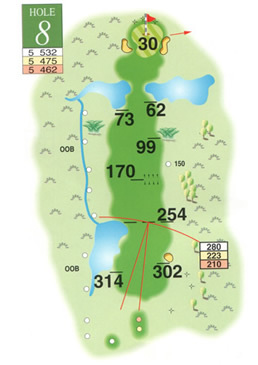 This hole is the longest of the par 5s with the tee shot placement crucial as there is a dyke bordering the left side of the fairway running into a pond at 280 yards. The other danger is a carefully placed bunker on the right which can snare the wayward shot. The prevailing wind can help here and the bigger hitters do try and make the green in two though holding the ball on the green from that distance can be difficult. Protecting the green some 60 yards short are two ponds which can easily collect the over-hit running ball so the ideal second stroke should leave a gentle pitch onto a good-sized putting surface hopefully avoiding the two greenside bunkers. The green offers some challenging but exciting putts and a par is on the cards for the steadier player.